I Can See in the Dark is narrated by Riktor, a male nurse who is quite unsociable and introverted. He has a very repetitive routine and considers himself superior to other people. He craves a female partner so he won’t be alone all the time but his lack of good looks makes it difficult to obtain a mate. Riktor is a sociopath, but none of the people he works with know that. They are fully aware that he’s a loner, and very hard to get to know, but they don’t initially understand the danger the poses to others, especially the patients. It was obvious from very early on that Riktor lacked a single redeeming quality, but I didn’t mind how horrible he was because he still managed to be a very compelling narrator. He had a unique voice and personality that made him feel fascinating and separate from the countless other fictional psychopaths out there. 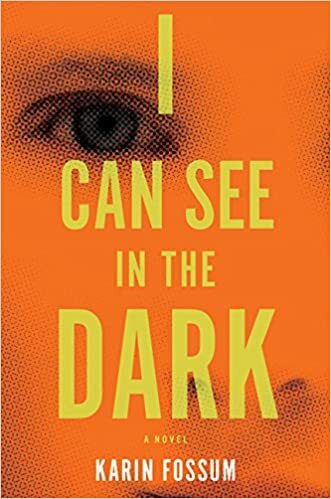 I wasn’t sure if I was going to actually read I Can See in the Dark because I had started it a couple of times and lost interest in it a few pages in. I’m glad I finally read it all the way through because I ended up being pleasantly surprised by it. It starts out with a cool concept and actually ends up delivering on it’s promise. This was my first book by Karin Fossum, and I understand that she mostly writes mysteries. People who are looking for a more traditional ‘who done it’ narrative might end up being disappointed by this particular novel, it contains mystery elements but feels more like a dark character study. It’s not a book that features characters that you grow to care about or even particularly like; it’s an emotionally cold story but in a way that fits the voice of the main character, who almost entirely lacks empathy. The only major flaw I saw in this novel is that it seemed to rely too much on coincidence to move it’s story forward. The relatively small cast of characters never seemed to be far away from each other, though none of them shared close relationships. I found it hard to believe that what happened to these virtual strangers always seemed to be intertwined. I felt like overall this was a pretty small quibble, and barely took away from my enjoyment of the book. I’ve read a lot of dark fiction and I am a person who actually enjoys novels with psychologically unhinged and unsympathetic narrators. I had never read a book quite like this one and had never encountered a main character like Riktor before. He felt very real to me, and I was impressed by the author’s ability to create a character who was so fucked up and make the reader feel like they knew him. Her ability to get into his head and his motivations was uncanny, and sometimes I felt like I understood him a little bit even though I was devoid of sympathy for his vile viewpoint and actions.